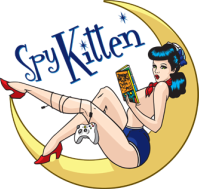 Spy Kitten is the cat's meow! An entertainer, muse and artist extraordinaire, I dream of the days when a gal could join up with a vaudeville troupe and travel around having adventures that were sure to include Gene Kelly and tap dancing. I grew up on stage, singing, dancing and acting--all with the hopes to bring a little more sunshine to the world. As an adult, I started with pin-up and fetish modeling and it was only a matter of time before I was whisked away to the wonder and enchantment of burlesque. I've studied burlesque with the lovely Vivenne VaVoom in Denver and with Madam Merci at Conscious Burlesque in Boulder. I've delighted in a class or two at Studio L'amour while visiting Chicago. In LA, I've studied with (and creepily idolized) "The Go All the Way Girl", Ms. Red Snapper as well as many other talented teachers and performers. I enjoy figure modeling and I've posed for Dr. Sketchy's (LA Chapter & OC Chapter) and Obsidian Entertainment. I have also read for Naked Girls Reading (LA chapter) and played stage kitten for Peepshow Menagerie and Fishnet Follies--LA. I have performed with Peepshow to Go-Go, Monday Night Tease, Peepshow Menagerie, Dr. Shocker's Jambortease and Ooh La La Presents to name a few. I've been in several horror productions (film and theatre) and have appeared on TV shows such as "Bones" and "True Blood". I started to produce short films in 2014 and I've served as Assistant Director on three short films. I'm the tart with a heart and over the last 10 years, I've volunteered with many non-profits and charities. I also served as the Charity Coordinator for the very first Hollywood Burlesque Festival in 2013. In early 2013, I co-founded Lusty Kitten Productions with friend & fellow performer, Mae Lust. Lusty Kitten Productions brings you fandom events...with a lusty twist. I adore obsessively talking about the impending zombie apocalypse, daleks, mermaids and unicorns. You can keep up with me on Instagram, Facebook, Twitter and Goodreads.